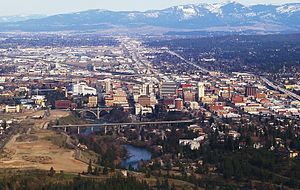 'S e Spokane (IPA: /spoʊˈkæn ) an dàrna baile as motha a tha ann an Washington sna Stàitean Aonaichte. Bha 212,052 daoine a' fuireach anns a' bhaile ann an 2014. Tha e suidhichte aig 562m os cionn ìre na mara. ↑ “Spokane (city) QuickFacts from the US Census Bureau”. U.S. Census Bureau. Air a thogail 12 an Cèitean, 2012. Air a tharraing à "https://gd.wikipedia.org/w/index.php?title=Spokane,_Washington&oldid=529612"
Chaidh an duilleag seo a dheasachadh 11 dhen Ghiblean 2017 aig 10:41 turas mu dheireadh.